Description: This set includes a white child-powered hand mixer with 2 yellow beaters that really spin when child squeezes the trigger on the handle. When child inserts the blades into the bowl of pretend cake frosting, it creates a realistic mixing effect. 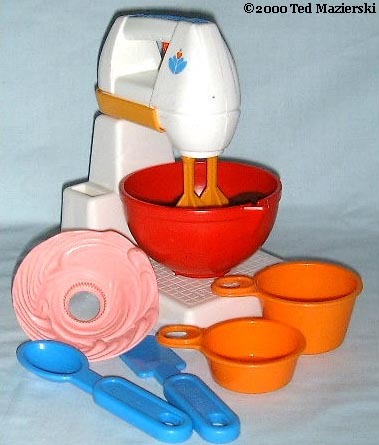 The set also includes a mixer base, a spoon, a spatula, two measuring cups, and three snap-in cake frostings that fit in the bowl. The hand mixer does not require batteries. This set was designed for children ages 3 to 7 years old. FPT7117 - White hand mixer with two permanentlly attached yellow beaters, a blue strip across the top with a "Fisher-Price" imprint on it, and a design of a red heart with 2 blue "leaves" under it on both sides of the mixer. The mixer has a red trigger under the built-in handle that makes the beaters spin. Measures 5-3/8" long x 2-1/8" wide x 7-1/4" tall (including beaters). FPT7118 - White hand mixer base with an area on the top for the accessory FPT7117 hand mixer, and a hole on the side for the accessory utencils. The base has a flat area infront of the mixer for the accessory FPT7119 bowl. The area for the bowl has indented grooves to prevent the bowl from spinning when the mixer is "mixing" the frosting in the bowl. Bottom of base is marked, "2114, ©1987 FISHER-PRICE". Measures 6-1/2" long x 4-5/8" wide x 6-1/4" tall. FPT7119 - Large red mixing bowl with a small pour spout on one side. The base of the bowl is sized to fit into the grooves on the mixer base. The bowl is sized to hold the accessory snap-in plastic cake frosting. FPT7120 - Brown *See "Variations" below. FPT7124 - RED 1/4-cup measuring cup with a small round handle. The handle has a raised oval-shaped edge with a thumb hole near the top. Bottom inside is marked, "1/4 cup, 2 ounces, .06 liter". *See "Variations" below. FPT7125 - ORANGE 1/2-cup measuring cup with a small round handle. The handle has a raised oval-shaped edge with a thumb hole near the top. Bottom inside is marked, "1/2 cup, 4 ounces, .12 liter". FPT7126 - Blue spatula with a thin spatula head, used to "spread" cake frosting. The handle is oval-shaped with a raised "Fisher-Price" imprint in the middle and an oval-shaped hole on the end of the handle. FPT7127 - Large blue mixing spoon with an oval-shaped handle and a round spoon head (straight vs. curved, like most spoons). 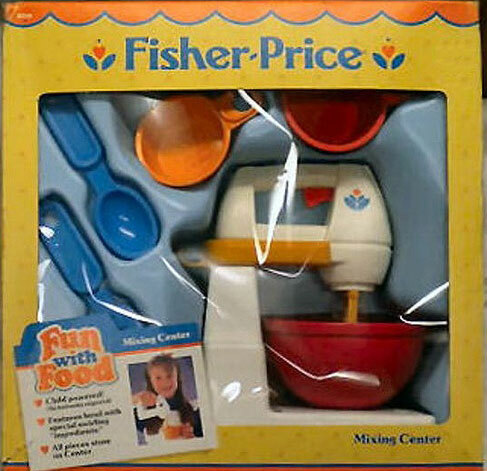 The handle has a raised "Fisher-Price" imprint in the middle and an oval-shaped hole on the end of the handle. *See "Variations" below. FPT44202 - ORANGE 1/4-cup measuring cup with a small round handle. The handle has a raised oval-shaped edge with a thumb hole near the top. Bottom inside is marked, "1/4 cup, 2 ounces, .06 liter". FPT7128 - Large white mixing spoon with an oval-shaped handle and a round spoon head (straight vs. curved, like most spoons). The handle has a raised "Fisher-Price" imprint in the middle and an oval-shaped hole on the end of the handle. FPT14815 - The molded whipped cake frosting was is also available in light brown/tan opposed to dark brown. FPT7129 - Sold in a 13" long, 13" high, 4-7/8" deep display box. 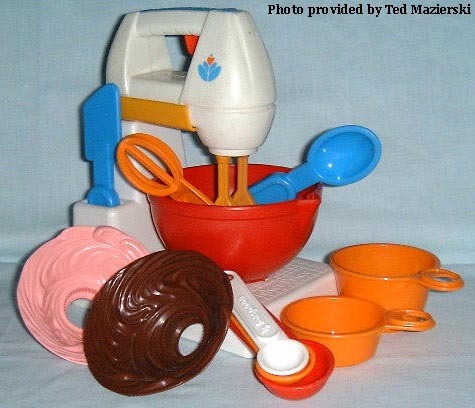 1990 - This set was also sold in #2146 Kitchen Appliance Assortment.